In the last session of the eternal security debate, Michael Brawner continued his rebuttal of the “once saved, always saved” argument. B.J. Clarke affirmed his position by answering questions that were put forth. 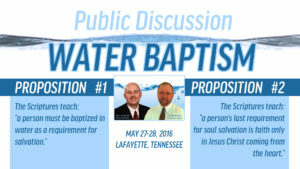 A public discussion on the eternal security of the believer was held on May 26-27, 2016. 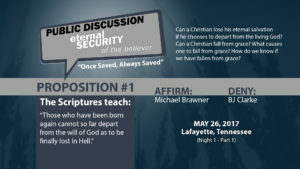 On the first night of the debate, Michael Brawner affirmed that the Scriptures teach that those who have been born again cannot depart from the will of God as to be finally lost in hell. B.J. 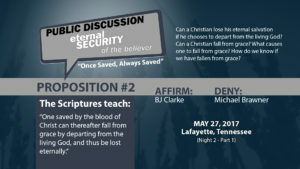 Clarke followed with his rebuttal that the idea of “once saved, always saved” is not biblically accurate. In this second session of the eternal security debate, B.J. Clarke continued his rebuttal of the “once saved, always saved” argument. Michael Brawner re-affirmed his position through responses to questions put forth. 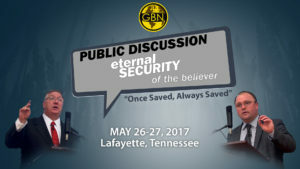 A public discussion on the eternal security of the believer was held on May 26-27, 2016. On the second night of the debate, B.J. 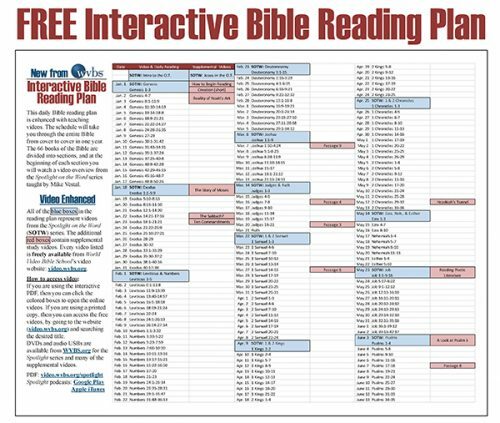 Clarke affirmed the Scriptures teach that one saved by the blood of Christ can thereafter fall from grace by departing from the living God, and thus be lost eternally. Michael Brawner followed with his rebuttal.